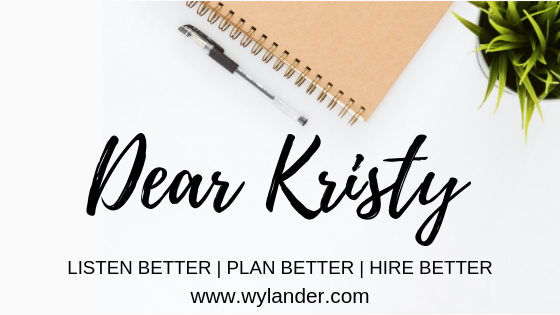 Dear Kristy: How Can I Find Techs? This is a question we get a lot. In today’s economy, with unemployment at a 50-year low, finding technicians can be difficult. Unskilled workers have more choices than ever, for higher pay. Plus, if we are being honest, many of their options are more glamorous than the life of a water tech. They could get an entry-level job at Home Depot at $12+ an hour that does not include on-call work, crawling around in bug and mold-infested crawl spaces and attics, dealing with the heat of summer months in homes without A/C, and the list goes on and on. So, how can you attract them into restoration instead? I have a few ideas for you. 1. A career with growth potential AND purpose. I think we can all pose a good argument that the restoration industry offers a true career path, with a purpose. Many of the candidates we talk to on a daily basis don’t have a college education, and have worked their way up from being a tech to project managers, estimators, operations managers, general managers, and even owners. Let them know the future growth opportunities within your company for the right person. If growth is something that interests them, think about creating a roadmap for them to reach their goals! This will get them excited about coming to work, and truly invested in the job they’re doing. It also makes the time of doing the tech “grunt work” more bearable knowing there are bigger things ahead. For someone who wants to make a difference in the lives of others, and find a job where there is true growth potential, restoration can be a GREAT fit! For Millennials, especially, seeing a future is key to engagement and retention. Unlike Home Depot, where some overtime might be possible, it’s likely there is more earning potential with your company. Do you offer on-call bonuses? What about other incentives once they move up the ladder – like commission on their jobs as a PM? Giving new or potential hires a clear picture of what their paychecks can look like, including bonuses, can be a solid motivator! What kind of training do you offer your new techs? Have you thought about going further with training than just sending them out with your best crew on day one? We suggest taking training a step further. When you hire a new tech, let them know you’re really going to take care of them and make sure they have the skills they need to succeed – as long as they are invested in the job and company as well. At Wylander, we’ve teamed up with the Restoration Technical Institute to not only help restoration find techs, but also send them through top-notch industry training to obtain their first IICRC certifications. Imagine the pride a new hire will have returning from a great training experience with a new certificate in hand! Want to learn more about this unique hiring and training program? Email Justin at Justin@wylander.com!